This document explains the process for using Web Print to submit a job to the print release stations. Note: You MUST be on campus and connected to the network in order to submit a print job. 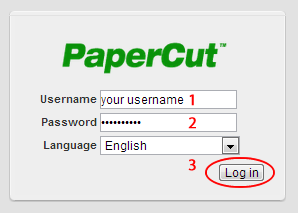 Step 1: Log-in to the PaperCut web interface at http://ecpaper:9191 or at http://print.etown.edu. At the log-in prompt enter your jaynet username and password and press Log in. Step 2:After logging in, you'll see the dashboard for PaperCut including the summary of your campus printing. 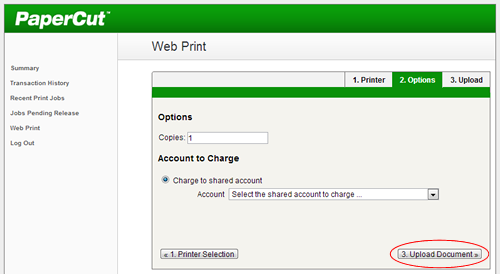 To access the Web Printing feature, click on Web Print in the left menu. 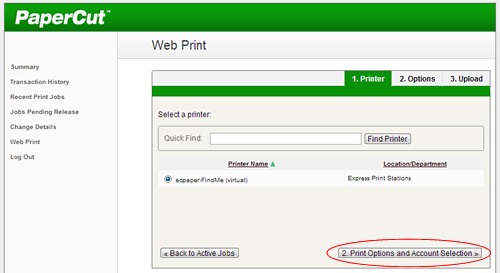 Step 3: To upload a new file for printing, click on Submit a Job >>. Step 4:Select the print queue you wish to print to. For most users, the only option available will be the FindMe virtual queue. This is the queue that allows printing to the Print Release Stations. Press the Print Options and Account Selection >> to continue. Step 5: On the next screen you can change the number of copies you wish to make as well as select the account you would like to charge the job to. If you are printing this document for yourself, select the Personal Account option. If you are printing on behalf of a department, you can select their account from the drop-down list. After selecting your options, press the Upload Document >> button to continue. 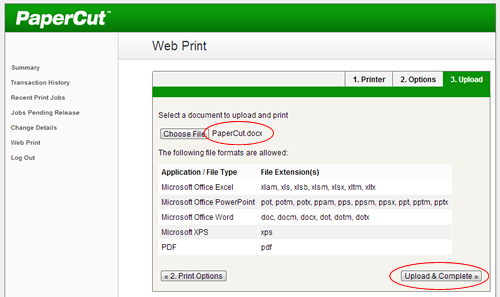 Step 6:Now you can upload the file you wish to print. Press the Choose File button. 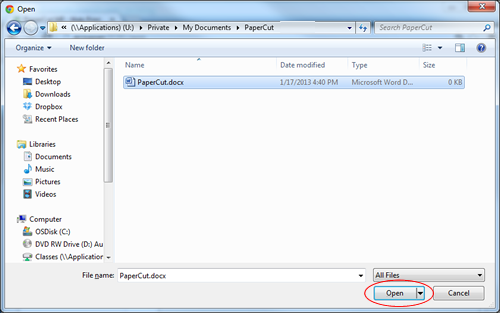 Step 7:In the pop-up window, navigate to the file you wish to print and press Open. 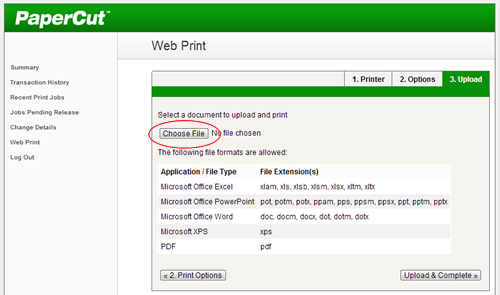 Step 8: You'll now see the name of the document you are printing next to the Choose File button. If you need to change the file, you can press Choose File again. Otherwise, press Upload & Complete >>. Step 9:Your file will now be uploaded to the server. The status next to your print job will start off as Submitting. Depending on the size of the file, it may take a few minutes for your file to be rendered. You do not need to wait for this process to complete. Step 10:Once the rendering process is completed, you will see "Held in a queue" under status. This means the job is ready to be released at any of the print release stations on campus. Once submitted, print jobs will be held in the print release queue for 24 hours.